The best way to properly clean pool decks in Houston, Tx is by pressure washing them. The first thing is understanding the different types of decks you will be cleaning. 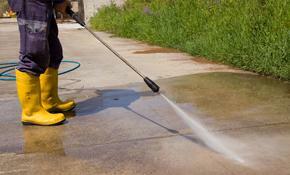 There are cool spray on decks, pea gravel pool decks,Tile decks, and spray on concrete decks. There are different techniques to pressure washing each of these pool decks in Houston, Tx. Always inspect the entire deck of any loose debris or cracks before getting started. For pressure washing pool decks in Houston,Tx call the professionals at SMC Cleaning Services @ 281 899-0402 for all of your pool deck cleaning needs. First of all, you need to have the right equipment for the job. Our pressure washers are 4gpm @ 4000 psi. The spray tips we use on our wands are 45 degrees. Also, you need a good leaf blower. The first thing we do before cleaning is we measure the deck to get a square footage. This gives the homeowner an exact price for doing the job before we get started. Then, you need to remove all pool furniture and pool toys off of the deck. The next step is to use your leaf blower to blow off all leaves, pine needles, and debris from the pool deck. When pressure washing pool decks in Houston ,Tx use a good deck cleaning chemical to loosen all mold and algae from the deck before pressure washing. Wet algae can be very slippery and cause a falling hazard. So we are extremely careful not to slip while pressure washing. When pressure washing in Houston,Tx never put the spray tip too close to the pool deck so you don't damage the deck. Make sure you put the spray wand at an angle away from the pool to avoid blowing dirt and debris into the pool. We always do a final walk thru inspection of the deck after cleaned to make sure all areas are pressure washed and cleaned evenly. After inspecting the deck, we replace all furniture and kids toys to where they originally were. For pressure washing pool decks in Houston,Tx call the professionals at SMC Cleaning Services @ 281 899-0402. You can also fill out the form below for a free quote. Don't forget all work is guaranteed and you will be happy with our work.